(?) King was the daughter of (?) King. Her married name was Mrs. N. A. Walwen. (?) King died on 7 April 1905 at 161 West Hunter St., Atlanta, GA. She was buried at Bremen, GA.
Louisa Augusta Bowe was born on 9 July 1814 at West Springfield, Hampden Co., MA.1 She married Lemuel Holcombe, son of Jabez Holcombe and Sophia Goddard, on 5 November 1834 at Green, NY.2,3 Louisa Augusta Bowe died on 30 April 1844 at Granby, Hartford Co., CT, at age 29.1,3 She was buried at Holcombe Cemetery Depot Hill, Granby, Hartford Co., CT.
[S422] Jr. Winfred R. Goddard, Goddard, Page 81, item 3817. George Spring was born on 20 February 1810 at CT.1 He was the son of Thomas Spring II and Jerusha Pomeroy.2 George Spring married Mahala Holcombe, daughter of Jabez Holcombe and Sophia Goddard.2 George Spring died on 12 June 1883 at age 73. He was buried at Copper Hill Cemetery, East Granby, Hartford Co., CT.
[S422] Jr. Winfred R. Goddard, Goddard, Page 82, item 3818. Bowman questions this child. Hiram Holcombe was the son of Jabez Holcombe and Anne Hosmer. Hiram Holcombe married Maria Latham on 27 March 1827. [S25] Hannah McPherson, Holcombe Genealogy, Page 100.2/Item A-6-7-5-8-2. Maria Latham was born on 25 July 1809 at Poquenock, CT. She married Hiram Holcombe, son of Jabez Holcombe and Anne Hosmer, on 27 March 1827. [S52] Henry R. Stiles History of Ancient Windsor II, Vol. II:Pg. 355. [S94] Nathaniel Goodwin, Genealogical Notes, or Contributions to the Family History of Some of the First Settlers of Connecticut and Massachusetts, Page 313/Item 35. [S116] Esther Griswold French and Robert Lewis French, Griswold, Page 129/Item 228. Bowman questions the wife. William Holcombe was the son of Hermaz Holcombe and Lucy Alford. Salina Holcombe was born in 1813. She was the daughter of Hermaz Holcombe and Lucy Alford. Salina Holcombe died in 1889. Hermaz Holcombe II was born in 1804. He was the son of Hermaz Holcombe and Lucy Alford. Hermaz Holcombe II married Emily Latham, daughter of Joshua Latham, on 9 March 1828. Hermaz Holcombe II died in 1887. He was buried at Elm Grove Cemetery, Windsor, Hartford Co., CT.
Hermes and Emily were enumerated in the 1850 Windsor, Hartford Co., CT, federal census. He was a farmer age 44, she was 42. Children in the household were Stebbins 19, Sumner 17, Joseph 11, Theron 9, William 3, and Ellen 1. Hermas and Emily were enumerated again in Windsor in the 1860 federal census, page 10. Hermas was a farmer age 55; Emily was 52. Children in the household were Joseph, a cigar maker, age 21, Theron N. age 19, William W. age 13, and Ellen M. age 11. [S25] Hannah McPherson, Holcombe Genealogy, Page 100.2/Item A-6-7-5-9-3. Emily Latham was born on 31 October 1807 at CT. She was the daughter of Joshua Latham. 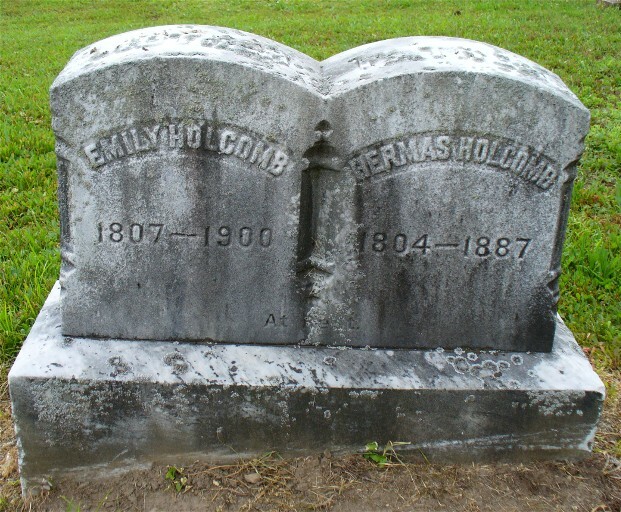 Emily Latham married Hermaz Holcombe II, son of Hermaz Holcombe and Lucy Alford, on 9 March 1828. Emily Latham died on 23 December 1900 at Windsor, Hartford Co., CT, at age 93. She was buried at Elm Grove Cemetery, Poquonock, Hartford Co., CT.
Emily was recorded in the 1900 Windsor census, widowed, living with the family of her daughter, Ellen Clark. The record indicated that she had only one child. Mrs. Emily Holcomb, who was 93 years of age and the oldest person in town, died Sunday night. She had been sick about three months and death was due to old age. She was he widow of Hermas Holcomb and is survived by three sons and two daughters. The funeral will be held at 3:30 p.m. in the chapel at Elm Grove. Almeron and Annis were enumerated in the 1850 Victory, Cayuga Co., NY, federal census. He was a farmer age 26, she was 21. Son Wallace was 11 months. Living next door was Allen Holcombe, his 4th cousin, once removed. [S25] Hannah McPherson, Holcombe Genealogy, Page 100.2/Item A-6-7-5-9-4. Alice (?) was born circa 1829.1 She married Almeron Holcombe, son of Hermaz Holcombe and Lucy Alford. Mary Holcombe was the daughter of Hermaz Holcombe and Lucy Alford. Capt. Jonathan Buttolph was also known as Capt. Jonathan Buttles. He was born on 28 March 1724 at Simsbury, Hartford Co., CT. He was the son of Dr. Jonathan Buttolph and Martha Holcombe. Capt. Jonathan Buttolph married Jerusha Dibble, daughter of Abraham Dibble and Dorothy Hayes, on 3 July 1746 at Simsbury, Hartford Co., CT. Capt. Jonathan Buttolph died in 1777. Both Stiles and Old Northwest Quarterly 6:191 f., kill Jerusha off before Jonathan and make him marry secondly, his stepmother, Martha (Loomis) (Phelps) Buttolph! There were nine children of this marriage. [S65] Deanna Holcomb Bowman Thomas Holcomb, Pages 70, 156. All of his descendants are called Buttles. He was ensign of 3rd Co., Simsbury, May 1774. Benoni Buttolph was born on 29 January 1725 at Simsbury, Hartford Co., CT. He was the son of Dr. Jonathan Buttolph and Martha Holcombe. Benoni Buttolph married Mehitabel (?) Benoni Buttolph died on 28 May 1812 at Simsbury, Hartford Co., CT, at age 87. Elizabeth Cornish was born on 25 September 1695 at Windsor, Hartford Co., CT. She was the daughter of Deacon James Cornish and Elizabeth Thrall. Elizabeth Cornish married Dr. Jonathan Buttolph, son of Sgt. David Buttolph and Mary Buck, on 24 April 1729 at Simsbury, Hartford Co., CT.
Daniel Buttolph was born on 7 April 1730. He was the son of Dr. Jonathan Buttolph and Elizabeth Cornish. Elizabeth Buttolph was born on 3 April 1731. She was the daughter of Dr. Jonathan Buttolph and Elizabeth Cornish. Elizabeth Buttolph married Noah Humphrey Jr., son of Noah Humphrey and Hannah Case, on 6 March 1751. Elizabeth Buttolph died on 6 June 1762 at age 31. Children of Elizabeth Buttolph and Noah Humphrey Jr.
[S65] Deanna Holcomb Bowman Thomas Holcomb, Vol. I:Pg. 70. Noah Humphrey Jr. was born on 15 January 1726/27 at Simsbury, Hartford Co., CT.2 He was the son of Noah Humphrey and Hannah Case. Noah Humphrey Jr. married Elizabeth Buttolph, daughter of Dr. Jonathan Buttolph and Elizabeth Cornish, on 6 March 1751. Noah Humphrey Jr. married Margaret Humphrey, daughter of Joseph Humphrey and Margaret Case, on 3 April 1763. Noah Humphrey Jr. died on 18 October 1790 at age 63. [S275] Frederick Humphreys, Humphreys, Page 320, Family 23. [S275] Frederick Humphreys, Humphreys, page 320. Isaac Buttolph married Sarah (?) Isaac Buttolph was born on 15 January 1732/33. He was the son of Dr. Jonathan Buttolph and Elizabeth Cornish. Sarah (?) married Isaac Buttolph, son of Dr. Jonathan Buttolph and Elizabeth Cornish. Sarah (?) died in 1753. Osias Holcombe died young. This son is not mentioned by McCracken or Seaver. He was the son of Judah Holcombe and Hannah Buttolph. Bowman lists Sophia Godard here with her #81175 and also with her #6758, Jabez (Martin, Joseph). In an e-mail she thinks that Sophia belongs to her #81175 (i.e., here) and Ann Hosmer belongs with her #6758. McPherson appears to correctly list Jabez and Sophia here and Jabez and Ann Hosmer as her A-6-7-5-8. Birth dates are from the Jabez Holcomb Family Record, recorded by Geo. H. Dibble, town clerk, Nov 3 1858. An eccentric railroad engineer, William Eli Talbot, had taken the stones (from East Granby's Smallpox Cemetery) and built them into the foundation of his workshop. Talbot also added an eclectic mix of other stones.
. . . one headstone that came from a North Granby Cemetery was found on is former property. 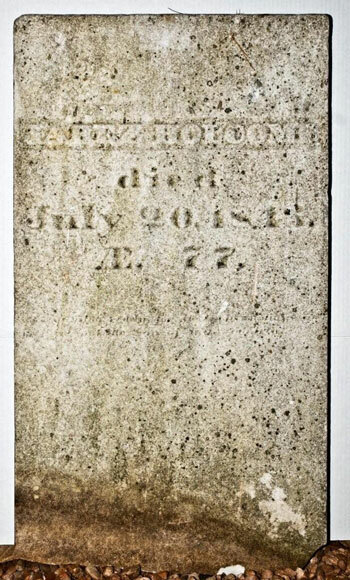 This was the stone of Jabez Holcomb, born 29 Sept 1765 and died 20 July 1843, age 77. He was the son of Elijah and Violet (Cornish) Holcomb and the husband of Sophia (Godard). Jabez was buried in a small family cemetery located across from 200 Loomis Street in North Granby, "on a little eminence about a hundred feet west of the highway." There were only five stones and probably seven burials in this little graveyard. Three generations of Holcombs were buried here. Jabez and his wife Sophia were the elders. Their unmarried son Almanzor, died in 1845, age 28, and Louisa Augusta, wife of another son, Lemuel, died in childbirth at the age of 30, in 1844. The youngest was the first to be buried in the cemetery. Little Martha Ann, infant daughter of Lemuel and Louisa, died in 1839, as spring was turning into summer. She was seven months and 25 days old. Unfortunately, this cemetery has completely disappeared. When the Holcomb farm was sold, the new owners used the land for pasture and cows grazed amid the stones. Eventually the gravestones fell, were broken, and finally disappeared during the 1950's. Without the Hale Collection listing the gravestone inscriptions, there would be no record of the burials. [S25] Hannah McPherson, Holcombe Genealogy, Page 115.1/Item A-8-1-1-9-4. [S65] Deanna Holcomb Bowman Thomas Holcomb, Vol. I:Pg. 152/Item 81175. [S498] Winfred R. Goddard, Granby Goddards, Page 79, Item 381. [S419] Carol Laun, Beneath These Stones, Page 44. [S683] Carol Laun, "NSHS News: Jabez Holcomb." Sophia Goddard was born circa 1774 at Granby, Hartford Co., CT.1 She was the daughter of Mary Goddard.2 Sophia Goddard married Jabez Holcombe, son of Elijah Holcombe and Violet Cornish, circa 1792.3 Sophia Goddard died on 24 July 1851. [S422] Jr. Winfred R. Goddard, Goddard, Page 79, item 381. [S498] Winfred R. Goddard, Granby Goddards. [S422] Jr. Winfred R. Goddard, Goddard, Page 80, item 381. [S712] Richard C. Roberts, "Buckland Family." Jedidiah Spencer married Sarah Buckland, daughter of William Buckland and Elizabeth (? ).